For those of you who aren’t aware, last Monday my sparkly, flower-laden Tarot Divination Bicycle was vandalised and five of the tarot cards attached to my spokes were stolen! While my bike and I are quite safe and we all should have nothing but compassion for he who did the deed, it was a rather peculiar event for the bystanders. You can read about it all here. And now that you are up to date – as promised in that blog post, here is the Tarot Reading For The Missing Five (and the Rescued Two)! We could approach this as a reading for the Uncle Fester-like fellow who did the stealing, but he did break some rules, with the whole taking-what-is-not-offered thing and also the non-observation-of-boundaries thing. Just as I am not going to do an on-the-spot reading for someone who might randomly request it when I’m out and about (I’m a full-time professional tarot reader. I work by appointment only. Would you ask a doctor you see in the street to “just take a quick look” at your rash? If you answered yes, you might want to rethink that), similarly I am not about to do a gratis reading for someone who stole from me. I think that’s only fair. So let us hear from the Queen of Wands, Death, The Knight of Wands, The Moon, and Strength (No. 8, the No. 11 version is safe), in their own words, about why this release from the wheel occurred so that they could get the attention they felt they needed. Queen of Wands: I’m not used to being ignored. I think The Collective needs more fire in their bellies and more grace in the way they move. I am sorry that he who ripped us from the Divination Bike was not exactly oozing graciousness, but really, something had to be done! I want the Collective to take a thoughtful gaze backwards at the transgressions of the past, and contemplate how some of the more insidious actions are now repeating themselves. I want the Collective to remember that they aren’t just here to have a nice little party, but to stoke the fires of humanity and work towards a collective enlightenment rather than a gossip-fest at best or a war-fest at worst. Ah! I need some gracious warriors to accompany me to create actions that include rather than exclude, so that adults can have the definitive understanding that behaving like babies is not attractive, and is not to be enabled on any level. Death: For my part, I am fine with this release. 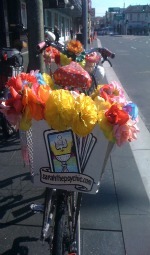 Psychic Sarah, you hid me between two cards on your bicycle! How dare you try and hide Death? Now that I have been released into the world in a looser, less attached way, I am going to help the Collective realise what is coming: me! Death! Haha! Which I very much hope none of you are shocked by, because really, you should have all learned about me in ‘Life 101’ by now. So yes, Death comes, so let this remind you to not to keep behaving as if you’ve got all the time in the world. Act in ways that ground you rather than distance you from yourself. Spend more time in your body, rather than floating out of it in fretting or fantasy land. Spend time with those who are nurturing rather than those who are destructive with their actions, words, non-actions and silence. Let me help you release the stories that don’t quite fit, and point you towards openings that invite spaciousness and clarity into the limited tunnel vision that has been imposed upon you by those who lost their way a longtime ago – so long ago that they actually believe they have it all figured out. Ignore the thoughts that hold you back, and invite in ideas that keep you curious about life in all its strangeness. Knight of Wands: I’m just glad to finally have some more room to spin my wand! I’m going to help the Collective find places in their communities where they can be safe, and where they can be themselves, without any fear of those who have an unhealthy tendency for persecution. Persecuting is boring! Gathering together with like-minded beings is amazing! From the outside such gatherings may look frivolous and pointless, but take a closer look and see how they strengthen people to be more bold and empowered in their relations with the wider Collective. Continue on with interest as you wheel through your days, and let me help you discover your own unique moves that express your authentic self, rather than merely being a copy of someone else. Be yourself or go home! Of course you miss me, I’m so soothing and lovely! See how I am waving in this image. I am waving you all goodbye. Haha just kidding, I’ll be in the sky tonight if you care to talk a look. And if it’s cloudy then just have a feel of how I’m affecting your inner waters. After all, you can readily see how powerfully I affect the tides on your planet, so with the high percentage of water you humans consist of, don’t think for a moment that I’m not impacting upon your state of mind and body. Now that I am more in your thoughts again, thanks but no thanks to the misbehaving Uncle Fester type, I wish to impress upon you the importance of water. Are you drinking enough water? Are you immersing yourself in it enough? If your waterways are polluted, have you thought about why that is, and can you think of ways you can prevent that from happening? From industrial pollution, to plastic bags and cigarette butts, there is much the Collective can do on a multitude of levels, no matter how small. Are certain members of the Collective doing that thing where they prioritise personal profit over the health of countless humans, wildlife and ecosystems? All bodies of water lead to other bodies of water. How you treat one can affect them all. So if more members of the Collective start purifying water wherever they can, then I can remain in balance with you all. And being in balance with the Moon means to notice the quieter aspects, the interrelated ways where we all coexist with not only humans, but animals, birds, insects, worms… so stop trying to separate yourselves off from this wondrously rich and complex existence. We’re all in it together, and we all have a part to play. Make sure your part isn’t to dominate but rather, align with humility and awareness of the greater whole. Strength (No. 8): Oh look, dear Collective, I love to share the love and if that means I must be ripped from a bicycle wheel in order for you to focus your attention on me, then very well, so be it. As the story goes, according to the eyewitnesses, I was apparently the last one to be ripped off, just after the Uncle Fester Imposter had been directed to return the cards (which he did, though only two. Hence we are the Missing Five rather than the Missing Seven). So, clearly I needed to be torn asunder from the deck to remind you of kindness, nonchalant fearlessness and judgment-free relations. Let me move amongst you to keep a certain lightness in your heart, even when the burdens are heavy. You don’t need much of me to keep you curious and connected. Make sure you invite me in, even if only briefly. I will be here for you when you need respite. I am always ready to engage with you. And finally, here are the Rescued Two – The Knight of Cups and The Sun – they who were returned to the wheel at the brave and firm request of one of my clients who witnessed the act of vandalism. Knight of Cups: I felt all woozy as I was lifted from the bike, not quite ready to be released from my sanctuary. I was concerned that I might lose myself in the grip of the destructive one. But here I now find myself, safely stapled to the wheel once more, and I am happy to keep on turning to remind you all to stay open, don’t hold back the flow of emotions, let it out, and wear totally awesome capes. Also, my position on the wheel has changed slightly thanks to the shift, and I am pleased with my new spot. The Sun: Climb back to the lighter places as often as you can. Stand in the shadows to observe who is hiding, but then return to a place of illumination where you can refuel and reinvent. It’s quite an effort to keep doing this again and again I know, but what else is there to do? Stop climbing? Stop searching? Stop trying to understand what life’s all about? Even though any understanding you ever have about life will always be constantly shifting, either subtly or dramatically, as you continue to grow and explore? Does this sound tiring? It need not. I am still here for you Collective, back on the wheel and turning with you. Let me refuel your weary minds and hearts and let us radiantly continue on together, whether the Missing Five return to us or not. Five cards may be gone to who knows where, but the remaining 35 will keep on spinning strong.